While the update notes for iTunes 10.3 claim that it includes the “Automatic Downloads” feature announced during WWDC, it seems that many of us haven’t been taking advantage of this feature… at all. 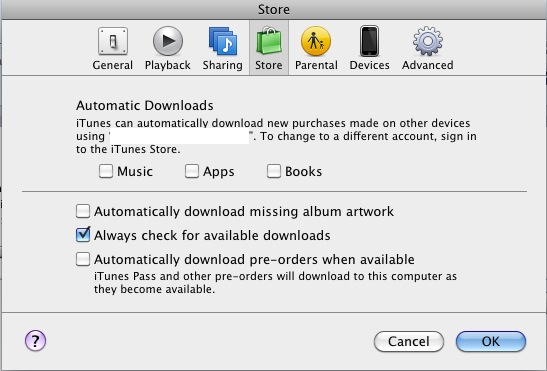 Turns out you need to enable Automatic Downloads for your music, apps, and books in the iTunes Preferences (under the “Store” tab) before the feature will start to work. Interestingly enough, after I purchased a book on my iPhone, my iTunes had already finished downloading it before my iPhone’s iBooks could swivel around to show the bookcase. For those with multiple iTunes accounts (for instance Europeans who have a US account for US software) be careful with this because Apple’s new policy will cut off multiple accounts using automatic downloads as part of their 90-day between switching accounts rule.